Ursuline Support Services, formally Ursuline Senior Services, has three main programs—Guardianship, Protective & Supportive Services, Independence Support Services. We provide an array of offerings to meet the pressing needs of adults, seniors and families suffering from abuse, neglect or financial and emotional distress. Explore our website to learn more about our services and how we can help you, or call us at 412-224-4700. Like so many young Americans, when David was called to serve his country during the Vietnam War, he went. He left that Southeast Asian nation in 1972, but the war never really left him. David returned home with memories of death and other horrors so troubling that even today, this 71 year old American hero is tormented by nightmares, night sweats and frequent bouts of deliberating depression. David’s story is a particularly poignant for me. As an active member of the military, I feel a strong connection to those who have served before me. As chairman of Ursuline Support Services’ board of directors, I am proud to volunteer for an organization helping David and others like him life as normal a life as possible, a life of independence and dignity. Michelle Smart, Director of Guardianship and Protective Services, and Karen Tobin, Director of Independence Support Services, recently visited the studios of WDVE-FM to appear on the station’s community affairs program. Interviewed by well-known host Sean McDowell, Karen and Michelle discussed aspects of their respective programs and how they help to meet the needs of our community. 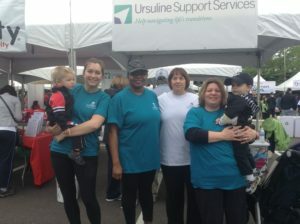 Join the Ursuline Team at the 2019 Highmark Walk for a Healthy Community! Consider joining our team as an individual walker with family and friends and helping us reach our goal to raise $10,000! Registration is available now. Interested in promoting your business and sponsoring our walk team? Click here to see the following sponsorship opportunities. We are here to lend support during transitions, for all people of all ages. Ursuline Support Services is a recipient of the Pennsylvania Association of Nonprofit Organizations’ Seal of Excellence for successfully completing their rigorous Standards for Excellence® accreditation program.